Epi 31 Developing Talent with Daniel Coyle –Daniel Coyle is a New York Times bestselling author ofThe Talent Code and The Little Book of Talent. He is one of the leading authorities on developing talent. He may not be a Black Belt in Brazilian Jiu-Jitsu, but his ideas about how to practice can help you understand how you learn. The methods he has found could help catapult your game to the next level and beyond. Epi 32 Alliance Black Belt Jonathan “Macarrao” -Thomas This week we are joined by Jonathan Thomas. Jonathan was recently awarded his black belt from Romero “Jacare” Cavalcanti. You will find Jonathan training, teaching, and positional sparring at The Alliance headquarters in Atlanta. Epi 33 Breaking things down with Ostap Manastyrski –Ostap Manastryski is a brown belt under Elliott Bayev, he trains and teaches at OpenMat Mixed Martial Arts Academy in Toronto Canada. Ostap breaks down BJJ videos on his YouTube channel, this is a great resource for anyone wanting to better understand BJJ. Epi 34 Making changes to your BJJ game –This week we take a break from having a guest on the show and Gary and Byron talk about making changes to your BJJ game. Epi 35- Listener Stories, Injuries Part 1 of 2 -This week we have stories from our listeners. These are stories about getting injured and overcoming the injury. This episode is packed full of great advice for anyone who has been injured, or if you have a teammate that has been injured. It is important to know what to expect and the advice will help get you back on the mat my friends. Epi 36- Listener Stories, Injuries Part 2 of 2 -More amazing injury and recovery stories from the listeners. Epi 37 Great Advice from Carlos Machado -Carlos Machado is a Red Black Belt in Brazilian Jiu-Jitsu. He has been teaching BJJ in the United States for over 20 years. He moved to Texas in 1995, and he is now running 6 BJJ schools. He is the oldest of the five legendary Machado brothers. Epi 39 The 3 Steps to Making Changes to Your BJJ -This week we talk about making changes to your BJJ and developing a game plan. We break it down into 3 main steps: 1) Define the objectives 2) Get help 3) Do the work. You are the only person how is ultimately in charge of your BJJ development take responsibility and make it happen. To help you obtain your goal we strongly recommend that your write it down. Epi 40 Interview With BJJ Black Belt Wil Horneff -This week we talk to Wil Horneff. This interview is packed full of great training advice and you can tell Wil has a passion for training and helping his students. Wil is a Black belt under Ralph Gracie, he owns a school in Westwood NJ called Training Grounds Jiu-Jitsu & MMA. At Training Grounds they teach BJJ, MMA, kickboxing, and also teach Kids Martial Arts in Bergen County, NJ. Byron throwing a brick at Gary as he chokes him with a mic cord. 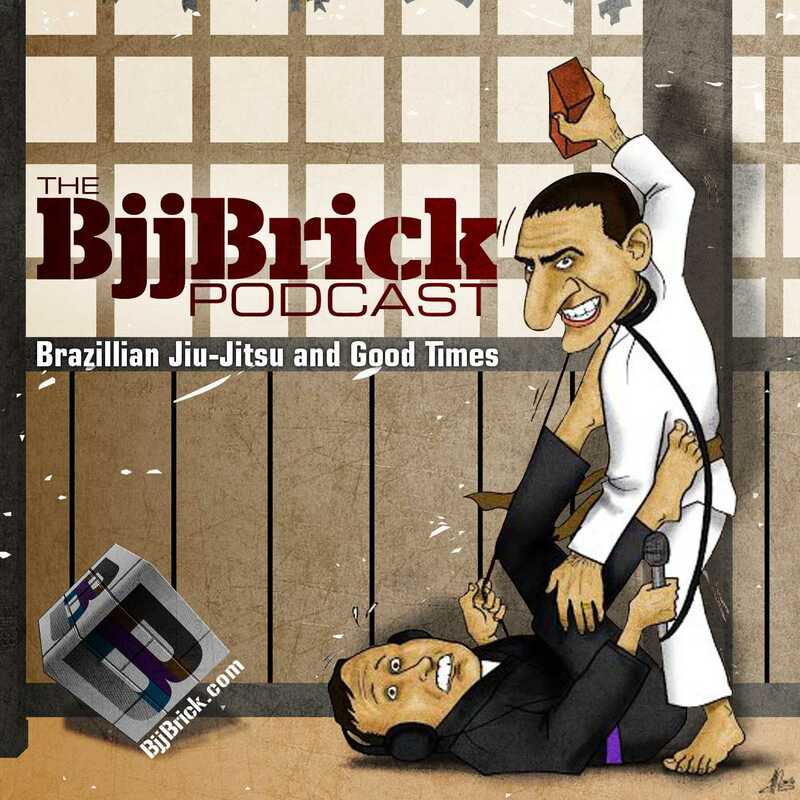 We (Byron and Gary) would like to thank everyone who has listened to the BjjBrick Podcast. We had a good time making the first twenty episodes. Here is a list with links to all the episodes so far in case you missed something. Epi 1- Train leg locks safely – We are both big fans of leg locks. There is a common thought in BJJ that leg locks are too dangerous to train. We share some of our advice on how to add leg locks to your game and train safely. 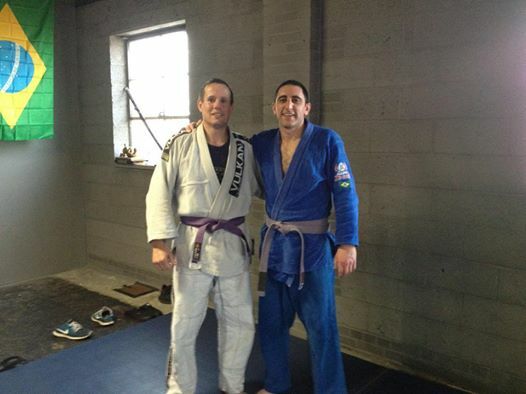 Epi 2- Bringing a friend to BJJ class – This is an important episode that were excited to do. It can be very disappointing if you bring a friend to class and they do not get a good chance to see BJJ. We give advice on being a good friend to someone that you invite to class. Epi 3- BJJ and self defense – This is our first interview episode. We interviewed our first instructor, BJJ Black Belt John Castillo. He gives some great advice on self defense. Epi 4- Interview with Andre Tim Monteiro – Andre is a friend who we are able to train with a few times a year. He shares some of his amazing story and gives some great advice to the BJJ community. Epi 5- Interview with Jason Bircher – Byron and Gary have known Jason since they were white belts getting smashed by the big guys (every day). Jason is a good friend with great advice to help your BJJ game. Jason was helpful in being our first phone interview, several technical difficulties occurred but most of them have been edited out. Epi 6- Interview with Jake Fox – This episode we are joined by our good friend and training partner Jake Fox. Were lucky enough to get him shortly after he received his black belt. Epi 7- The 12 Commandments of Brazilian Jiu-Jitsu from Carlos Gracie – Jake Fox stayed around and talked with us for another episode. 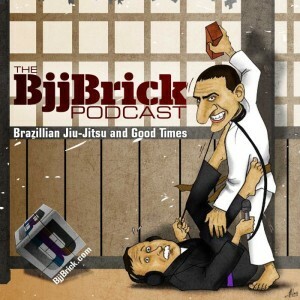 We talk about the 12 Commadments of BJJ from Carlos Gracie. We do much more that just read the list and agree with everything, we give some of our opinions. Epi 8- To gi or not to gi – Our friend and training partner Matthew Lowe joins us and we talk about the differences between training with and without the gi. All three of us have different preferences that leads to an interesting conversation. Epi 9- An interview with A paramedic, what to do when someone gets hurt in class – Craig is a fellow BJJ practitioner and paramedic. He shares some knowledge from his many years of experience in the emergency medical field. He will help you know what to do should someone get hurt in class, we cover everything to the minor soreness, to the call 911 this is a serious injury. Epi 10- Dealing with Injuries – Craig stuck around and we covered this topic that will effect anyone that trains BJJ. We get some great tips that will help you get back on the mat soon and feel better when you are not on the mat. Bonus Episode: What happened to Anderson Silva’s leg? – This bonus episode was put out shortly after Anderson Silva injured his leg. We talk about some of the reasons that might have caused this crazy injury. Epi 11- Underdogs and what we can learn from them – Are you an underdog? This episode we talk about what underdogs can do to turn the tables and we cover some historical underdog stories. Epi 12- The Different types of white belts – Everyone starts at white belt, but everyone brings something to the mats from past experience. We talk about some of the different types of BJJ white belts and how they can use their past experiences to their advantage. Epi 13- Dallas Niles of Lovato BJJ – Dallas Niles was in town and Gary did not miss the opportunity to talk with this up and coming BJJ star. Dallas shares some of his philosophies and training strategies that have helped him in his BJJ career. Epi 14- Renato Tavares Interview – In this interview Renato Tavares shares some of his BJJ knowledge and his personal story. Renato has been a vital part of Byron’s BJJ training and it was a honor to have him on the podcast. Epi 15- The Business side of Brazilian Jiu-Jitsu – If you have ever wanted to open your own BJJ school but did not know where to start you should check out this podcast. We talk to our friend Shawn who consults many small businesses for a major bank. Shawn will steer you clear of many common mistakes for new business owners. Shawn also gives some financial advice for the pro athlete. Epi 16- Brian Freeman- Training BJJ with a T4 spinal cord injury – This is a inspirational episode! We bring you an interview with Brian Freeman; he is training BJJ with a T4 spinal cord injury that has left him paralyzed in his legs. His attitude and excitement for the martial art is inspiring. Epi 17- Interview with BJJ Black Belt Roy Marsh – Roy Marsh, the coach of Brian Freeman, is a wealth of BJJ knowledge and experience. This was a fun interview for us because we both learn a lot about our own BJJ during the interview. Epi 18- Zak Maxwell Metamoris 3 Preview – Zak Maxwell is one of the top BJJ athletes in the United States. He talks about his upcoming match with Sean Roberts in Metamoris 3. Epi 19- Sean Roberts Metamoris 3 Preview – Epi 18 and 19 go together as we interview the athlete that will be hitting the mats in Metamoris 3 against Zak Maxwell. Sean Roberts is a fierce competitor that is well known for finishing some tough competitors. Epi 20- Growth Vs. Goals: what is better for your BJJ? – There are two different training modes we can be in. Growth mode is when you are focused on learning and getting better. Goals mode is a time that you focus your training on a specific goal. Are you in the right mode for you right now?